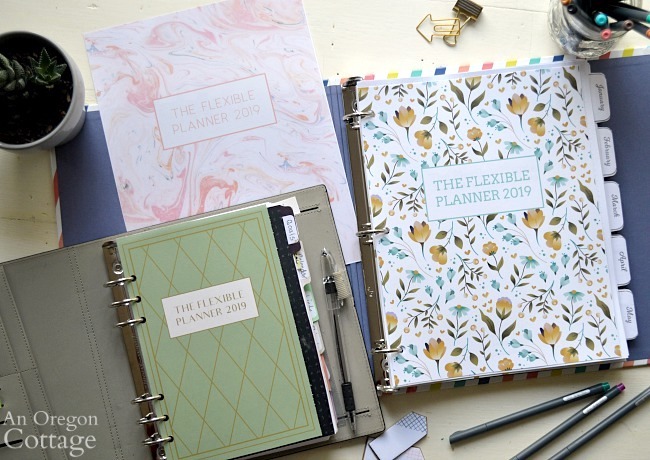 Looking for the most flexible planner out there? You’ve come to the right place! With all the adaptability of bullet-journal style planning without the constant re-creating of your repeated pages, The Flexible Planner allows you to live by design – setting and achieving goals, planning ahead, and developing new habits, as well as journaling and keeping track of what you want to remember! Want your life to look different at the end of the year? In five years? The only way to do that is to stop letting life just happen to you and start planning! It doesn’t have to be a lot or be overwhelming – even just a little bit of planning can help you use your time better and accomplish the things that are important to you. In my experience, this is the key to planning – and planners: that they represent YOU. That your life, schedule, and ideals are considered. New to the idea of planning and would like to try something adaptable. Looking for a way to help you be intentional with your time. Drawn to the concept of simplified planning. Not interested in remaking pages over and over. 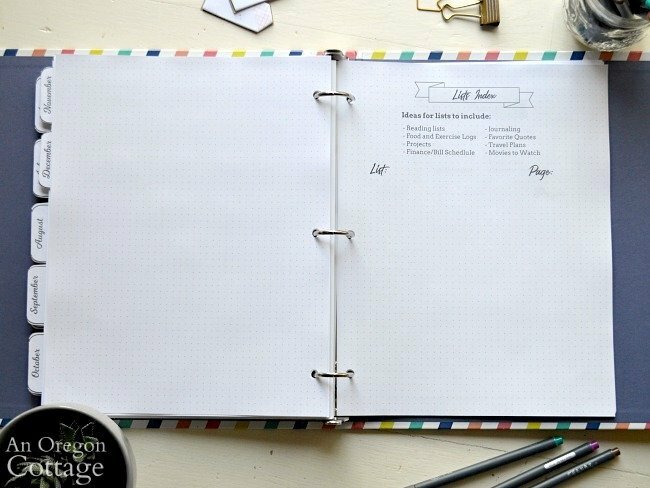 Wanting to keep your ideas, lists, and to-dos all in one adaptable place. Needing a bit of guidance to keep up with a few key goals. Interested in adding your personal stamp to your planner. OR are fine with leaving it as-is (because…flexible!). 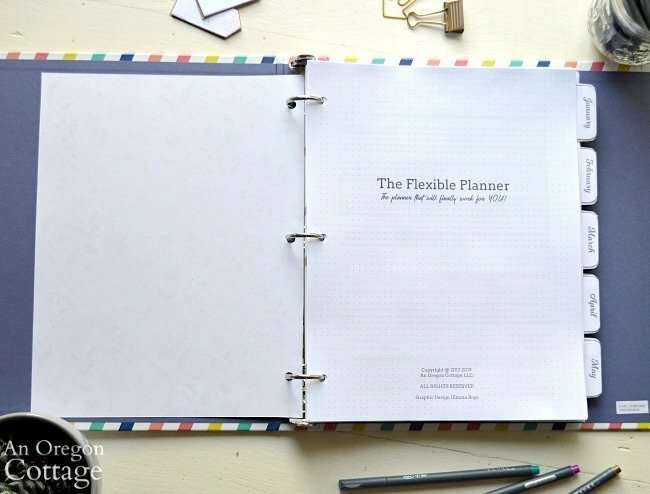 Then The Flexible Planner is for you! I know what you may be thinking – does the world really need another planner? To be completely honest with you, I thought that same thing, too! Which is why I have a graveyard of planners (both printed and on my computer) that all lasted about…3 months. One may have even made it to the 6 month mark because I just had.to.make.it.work. Then there was the one year I thought I’d put my own together using all the different free planner pages out there. That took a ton of time and resulted in a mish-mash that basically became a big to-do list. The problem? My needs and personality didn’t fit in all the boxes and it was exhausting trying to. So many pages and sections just went unused. And after talking to others, I know I’m not alone in this. 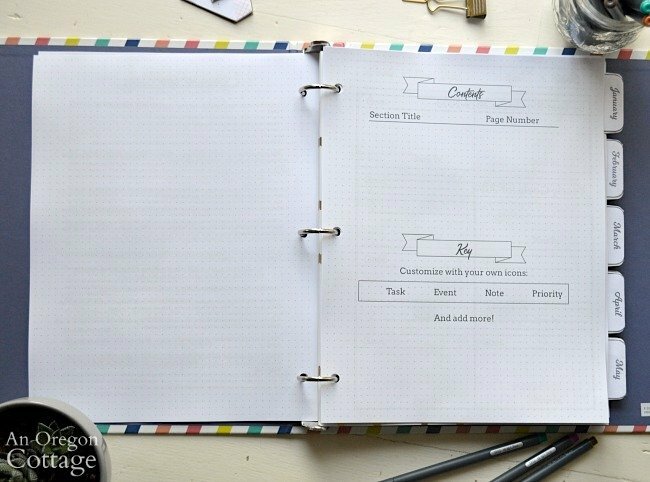 Have you struggled with making a planner fit your needs, too? Are you simply wanting something that can help keep you on task, make sure you don’t forget things, guide you (gently, thank you very much) through accomplishing goals, and maybe have some space for other things you’d like to add? I did not want to draw/write all the months and weekly pages over and over (and over…) again. I barely had time to use a planner let along recreate it almost weekly. Wasn’t there some sort of happy medium? Something that had a little bit of traditional planner and a little of the bullet journaling concepts? 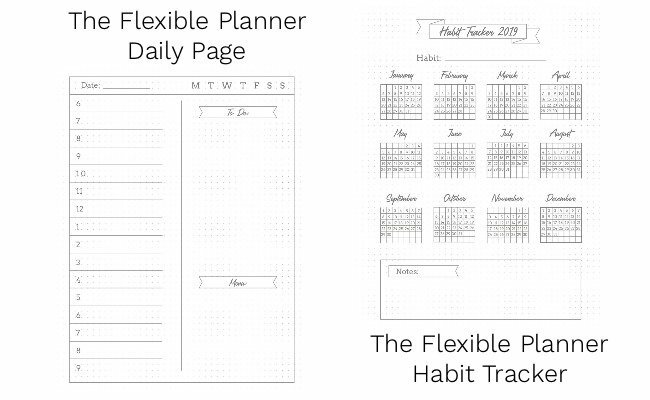 How is The Flexible Planner Unique? – With a Contents page at the front and one before the Lists section, you can easily keep track of your lists, notes, and goals. There are pages to help you through steps of making and working on goals, but you’re in control of what you work on – and when. 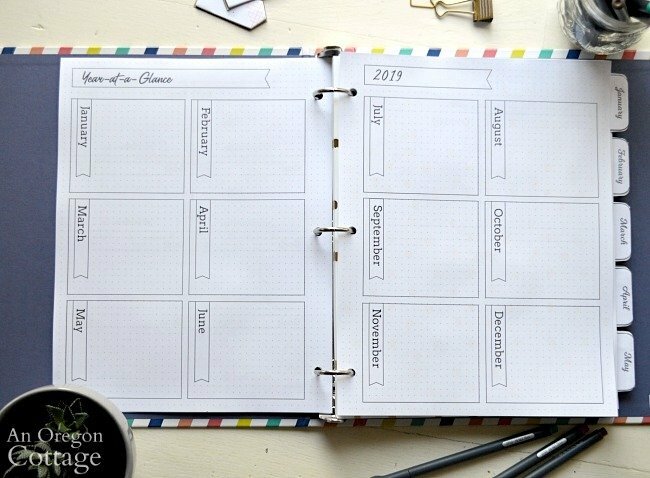 – Use the Monthly Calendars in the traditional way – or for only planning your menus or your goals. – The Weekly Page layout is where The Flexible Planner shines, I think! There are no wasted spaces, no areas you won’t use because you get to create what you need for each week within the simple framework. When life changes, your planner can change with it! If one week you have a lot of appointments, add hours to the day columns to keep track of it all. On a slower week, use the columns as a to-do list to work on the goals or separate them into morning, noon, and evening sections. It’s up totally up to you. – The Lists section is my favorite! Finally a place to keep all.the.things. Notes from a meeting, kids sayings, movies you want to watch, books you’ve read, and so much more. 170+ pages with simple, key prompts and ideas where you need – and plenty of space to make it your own. Simplified goal setting steps and tips. Five year and yearly goal page. Goal Action Steps to actually achieve your goals. 2-page spread for long-term planning of goals, trips, events, and more. Monthly goal planning page and a title page for each month where you can write inspirational quotes or verses. 2-page monthly spreads with room for monthly goals. Weekly 2-page spreads with section for 3 weekly goals. Lists index page – the key to easily finding the lists you make. 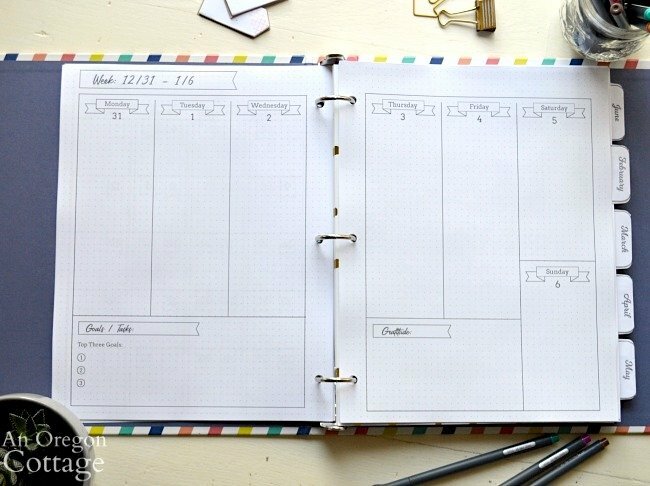 Empty dot-grid pages (you can print as many as you want) to keep track of anything you want: books to read, birthdays to buy for, daily gratitude, food journal, budget tracker – the sky is the limit! AND Your Choice of 3 Cover Pages! I’m loving these designs for 2019 – we tried to cover the bases whether you’re a floral person, linear, or fluid. Choose one or choose them all and switch them out mid-year. A Daily Planning page in both sizes. A Yearly Habit Tracker to make things like exercise, healthy eating, reading goals, etc. easy to track at a glance. You get ALL the files for the most flexibility (both dated and undated) for only $12.00! A multi-page guide that will help you set up your planner, give tips and instructions for printing, and walk you through how to set realistic, simple goals (the Simplified Goal Setting is also included in the main planner this year for easy reference). 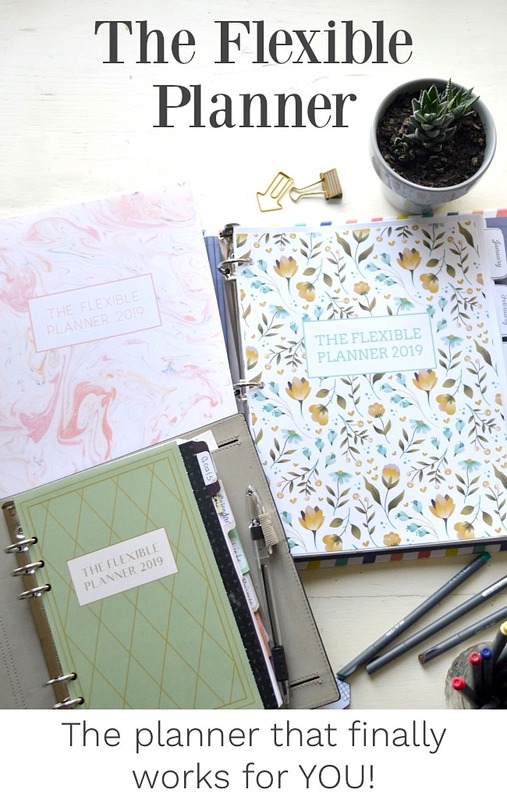 Each Flexible Planner digital file includes both 2019 dated pages and undated versions so you can start anytime of the year. You’ll receive all file sizes so you can change your planner size in the future without having to purchase a new size. 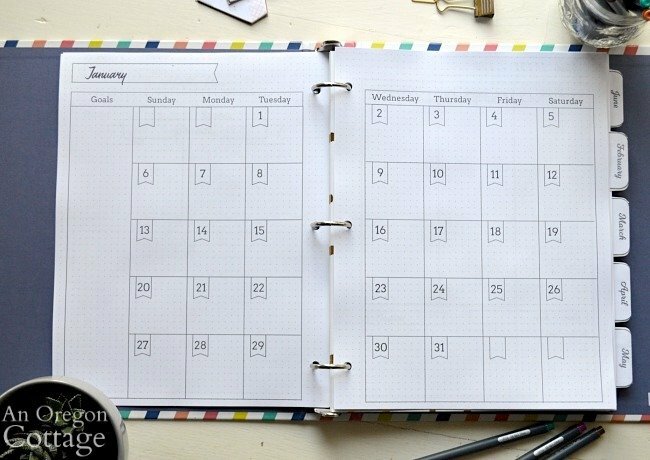 The Flexible Planner is a digital item – you will not receive any physical products. The files will arrive to your email immediately upon purchase (if you don’t get them check spam or gmail folders). When you download the files, they will be in zipped folders. You will need to unzip/extract the files from the folder in order to access them, usually by double-clicking. All files are in PDF format. You may need Adobe Reader to view and print them. Adobe Reader can be downloaded for free here for Mac users or here for PC users. Alternatively, you can print using Chrome Browser. (More detailed printing instructions will be included in the Fast Start Guide). The beauty of The Flexible Planner being a printable product is that you don’t have to print the pages that you don’t want (although I think they’re all perfect!) AND you can print as many of the ones you do want as you’d like (like the blank dot-grid pages). The included Fast Start Guide has printing instructions on how to best print each of the different sizes. I purposely chose a gray color scheme that can be printed black and white, which is cheaper and uses less ink. And if you do choose to use colored ink, washi tape, and stickers, the neutral colors will also help them to stand out. It’s another way The Flexible Planner can reflect YOU. Are you ready to make and stick to goals? Are you ready to stop letting life just happen to you? Then join me in planning (a little or a lot) to help create the life you want! Live by design and not by default.